To find more things to do, where to stay, other places to visit, and tourist information, read Nainital holiday builder app . 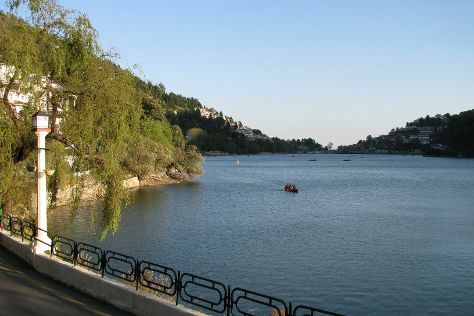 Kolkata (Calcutta) to Nainital is an approximately 8.5-hour combination of flight and taxi. You can also drive; or do a combination of train and taxi. Wrap up your sightseeing on the 22nd (Sat) to allow time to drive to Rishikesh. You'll find plenty of places to visit near Rishikesh: Haridwar (Ganga Aarti at Haridwar & Har ki Pauri). There's still lots to do: relax and float downstream with a rafting and tubing tour, take in the views from Lakshman Jhula, take in the spiritual surroundings of Triveni Ghat, and indulge in some personalized pampering at some of the best spas. For ratings, more things to do, and other tourist information, read Rishikesh trip planner . Traveling by car from Nainital to Rishikesh takes 5 hours. Alternatively, you can do a combination of taxi, train, and bus; or take a bus. Finish up your sightseeing early on the 25th (Tue) so you can go by car to Mussoorie. Venture out of the city with trips to Dehradun (Shri Parkasheshwar Mahadev Mandir & Tibetan Buddhist Temple) and Robber's Cave, Gucchu Paani (in Malsi). There's much more to do: admire the sheer force of Kempty Falls, take your sightseeing to a higher altitude at Gun Hill, stop by Himalayan Weavers, and contemplate in the serene atmosphere at Santura Devi Temple. For maps, ratings, other places to visit, and tourist information, read Mussoorie trip planner. Traveling by car from Rishikesh to Mussoorie takes 1.5 hours. Alternatively, you can do a combination of bus and taxi. Finish up your sightseeing early on the 28th (Fri) so you can travel back home.